With support from the Australian Aid Direct Aid Program (DAP) and the HCC, the Dominica Diabetes Association (DOMDA), launched the community screening component of the BPCCA I on May 15, 2015 with a mini- Health Fair at the Seventh Day Adventist (SDA) church and grounds in the community of Tarreau, Dominica. 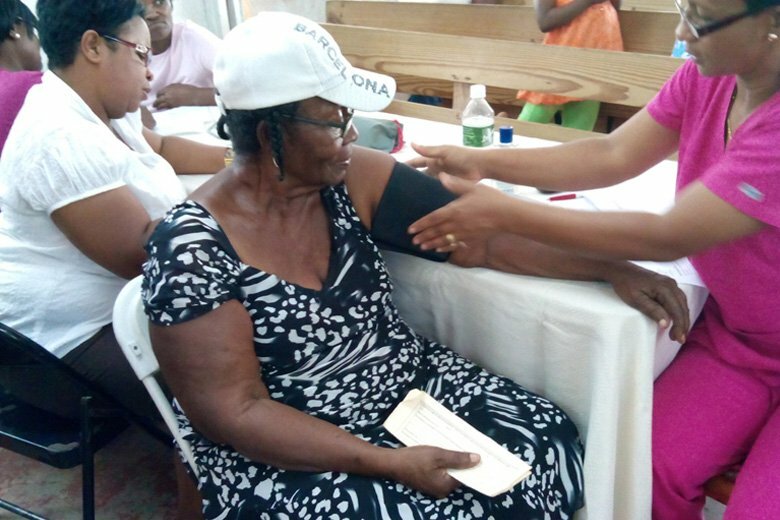 Dominica Diabetes Assocaition Screening on the BPCCA 1 ProgrammePartners included: The St. Joseph District Health Team are key partners, the Health Promotion Resource Unit of the Ministry of Health, particularly the nutritionist and the communication officers. The Director of Primary Health Care, Dr. Laura Esprit was also in attendance, so was the media and scores of villagers. Main activities for the day included: blood pressure screening and education; an exhibition of and counseling on food portions for healthy eating; low salt food tasting of normal everyday food prepared with little or no salt and utilizing fresh garden herbs grown in Dominica; and a display of the volume of salt and sugar in particular processed food. To date almost 100 individuals have been screened and DOMDA aims to screen approximately 700 more over the coming months. For more photos from the screening – click here.